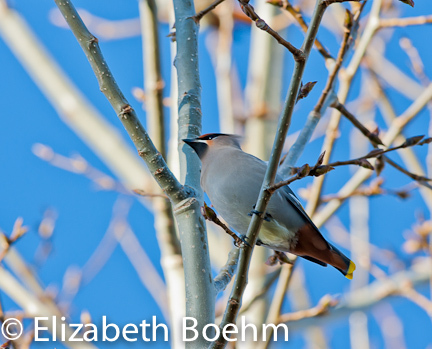 Recently I have had several friends discuss their Cedar Waxwing sightings with me. This made me stop and think, did they really see a Cedar or are they seeing Bohemians? I recently was witness to an incredibly, large flock of Bohemians near Fremont Lake. There were 300+ birds creating a very, good possibility of a mixed flock. The group flew over, flashing their bellies with the last light of the day, clearly showing a chestnut-colored patch under the tail. Very excited I thought: ah, yes the Bohemians have arrived for the winter. 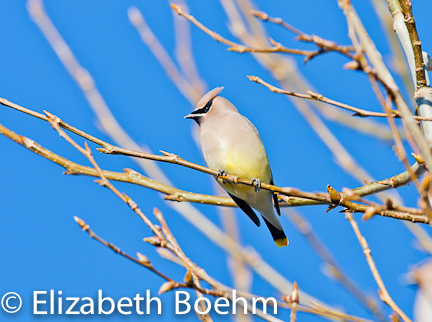 Cedar Waxwings will nest and summer here in Sublette County, WY but Bohemians prefer the northern portions of North America for their summer home. Both species look and sound very similar and can be in the area for the winter; I have observed more Bohemians at this time of the year than Cedars. They are gregarious in nature and move about in flocks looking for berries. I have witnessed the flocks working the juniper trees, gleening the small, blue, aromatic berries. The birds are very erratic and are not always in the same place day to day. A colorful bird with their waxy, red wingtips and yellow tail tips they are always a pleasant surprise! So if a flock of birds flies over or you witness a group in a berry tree making a trilling sound, take a closer look under the tail, brown=Bohemian, white-light gray=Cedar. It is actually more obvious than you would think! One of my favorite ways to photograph, is to sit in one place and observe what is going on around me. Some days not much will happen and at other times a pleasant surprise comes along. I was enjoying a calm morning at the edge of one of our local waterways and sure enough I get a quick glimpse of a small, brown tail ducking behind a log. I waited to see if I would get another sighting for a positive ID. In a short amount of time, out pops this beautiful American Mink. He proceeded to hunt along the edges of the creek and would quickly disappear into the rocks. I followed him briefly and was able to capture several photos. Definitely a challenge to the photographer, the mink is very agile and quick, bounding over and around boulders. His streamlined body will also allow him to swim across the creek and dive into the deeper holes of the river. 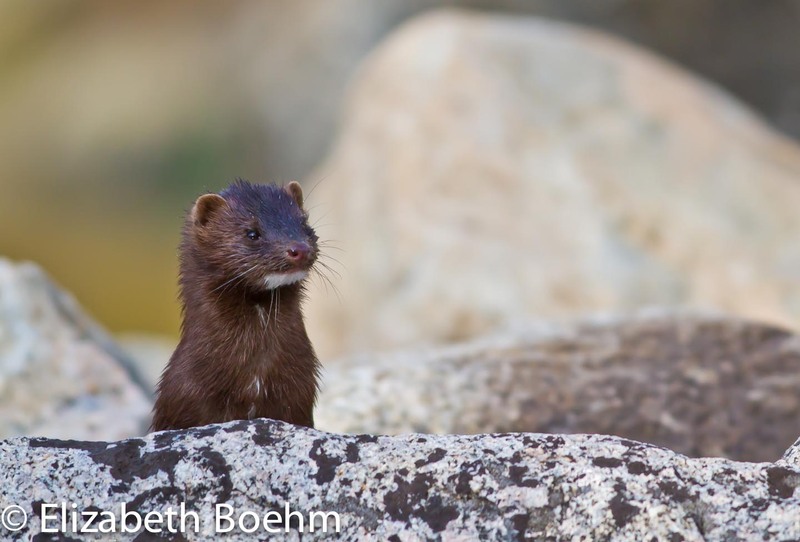 Not often seen, the American Mink is a native to North America and lives a solitary life around water where its diet includes fish, rodents, birds, and crustaceans.